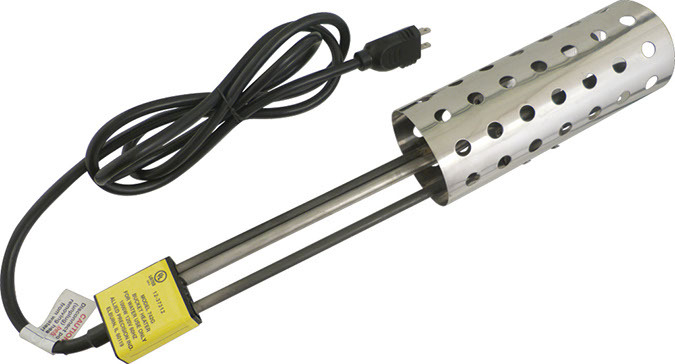 Preheat your mash before beginning the brewing process with this Electric Bucket Heater 1000w from MoreBeer! This handy little tool works in conjunction with a product like the Ranco or Johnson temperature controller by enabling you to set an exact hot liquid temperature on the controller, and then attaching it to the bucket heater. The temperature controller will turn off the bucket heater once it reaches your desired temperature. Our bucket water heater is designed to use with water in a bucket or cooler where an open flame cannot be used, and you can even use it to heat a bucket of water for cleaning with a powdered brewery wash.,This water bucket heater measures 17 inches from the handle to the tip and comes with a 6-foot long cord. It requires at least 6 inches of water for full submersion, and it can only be used with a maximum depth of 14 inches. �Unit has stainless steal heating element and guard. �Does not include clip for mounting.�,,Please Note - Having electrical devices around liquid can be hazardous, and should not be left unattended. Please use caution while using this device, and read the instruction manual prior to use.